MarketSaw - 3D Movies, Gaming and Technology: Hilarious New Commercial For Air New Zealand With A Middle-earth Twist! 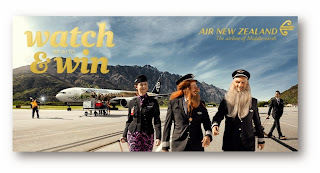 Hilarious New Commercial For Air New Zealand With A Middle-earth Twist! Love it when corporations get creative like this, and why not? New Zealand IS Middle-earth right? I won't spoil a thing for you - you have to watch. But to top it all off, you could win seats at the premiere of THE HOBBIT: THE DESOLATION OF SMAUG at either Wellington or Los Angeles! For more info on the contest, head on over to Air New Zealand. Oh and advance tickets for DESOLATION OF SMAUG are on sale tomorrow!